I walked into the house Me, Damon and Stefan were staying at. I heard Damon upstairs and Stefan was sitting on the couch. There was a dead girl next to him, one girl playing the piano and many around him dancing. "Stefy?" He looked at me and glared,  then smirked. "So you do Eli?" Stefan lunged at me and I screamed. Suddenly Damon was shelding me. I grabed on to his shirt and wimpered. "Stefan! You would hurt our sister? You know what mother said before she died." 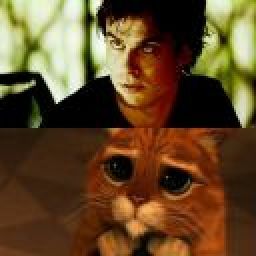 Damon scolded. Stefan scoffed. "So? You think I care?" "Please stop fighting..." I choked out, my voice barely over a wisper. "Why? Were fighting over you Elizabeth! Everything is about you! Don&apos;t you know? You killed Mother! You are a monster!" Stefan screamed. I sobbed and Damon turned around, picking me up. "Do not say that!" Damon yelled. "You know its true!! Your a Monster Elizabeth." I wimpered again. " Do you see what your doing right now? You are tearing me and Damon apart!!" "Go to Hell Stefan! You are bringing this onto yourself." Damon ran upstairs and locked us in his room. He put me on the bed and went to get one of my nightgowns. He handed it to me and I walked into the bathroom. I striped down to my underwear and stepped into the dress. Is it realy my falt? I thought to myself. How could I look so much like my kind mother, and be so  Evil? I leaned against the wall and sank down, sobbing and shaking. A knock  came from the door. "D-am-i..." I whimpered. He came in and picked me up off the floor. I clutched his shirt and he sat on his bed. "Shh.... its okay Piccolo." Damons cooed. He played with my hair and I relaxed a little, but I was still shaking. "Is it true? I killed mother?" Damon kissed my head. "Mother got a disesie after you were born. It was inactive for two years then she got realy sick. You did not kill her, and Stefan didn&apos;t mean any of that." "Then why did he say it?" I shook harder and Damon smoothed my hair down. "It was the blood talking." I leaned into him and calmed myself down. Soon I fell asleep. Damon grabed me and walked out of his room. I woke up and whined. "Damon... where are we going." He bit his lip. "No.. What about Stefan." I didn&apos;t care if he tried to hurt me. He was still my brother. "No! No!" He kept me against his chest and walked away. Stefan and I sat in his car going home. I still had yet to tell him and Damon about Jeremy being my boyfriend. And that he knows were vampires. And that we kissed. Wow, this is gonna be one fun night. We got to the bording house and Damon was sitting on the couch drinking burbon. I smiled and sat next to him. Stefan sat on the other side. "Yeah?" Damon asked. Stefan looked at me. "Jeremy kinda knows about us..." I said looking at the floor. "You mean us being vampires?" I nodded. "Lizzie..."
"Yeah.." Stefan cut in "About that..... Elena knows too." "She figured it out for herself!!" "They beter not tell anyone." Me and Stefan nodded. Damon draped an arm around my sholders. I bit my lip, knowing I had to tell them. "Stefan, Damon, you know how you guys promised me more freedom?" They both nodded. "Jeremy and I are kinda together...." Damon looked at me and his eye twitched. He took a breath and calmed down. "Im.. Ha-ppy for you..........." I smiled and looked at Stefan. He looked genualy happy. I desided to hold off telling them we kissed- made out. That was my first time and I knew they would be pissed. "Lizzie, I can see in your eyes. What else?" "I told you, nothing." I said. "I don&apos;t belive you." Damon said. "Can you just drop it?" I asked. Damon sighed and walked to me. "Please tell me?" I sighed. "Fine. Me and Jeremy kissed.........." The "kissed" part came out as a murmur. Fury suddenly appered in both my brothers eyes. I knew they heard it. "What was that?" Damon spoke through his teeth. "I&apos;ll kill him." Stefan said. "No no no! You guys can&apos;t protect me forever." "We can try!" They growled together. "NO! You two promised me more freedom! Besides, we all know what will happen if you keep me away from what I want to do." Stefan looked at Damon and Damon looked down. "I&apos;ll end up pushing you two away, and I don&apos;t want that to happen. I love you guys too much. Please let me do what I want to do with my life." Stefan nodded. and hugged me. Damon looked at us. "If he hurts you in any way-"
"I&apos;ll be fine." Damon hugged me I nuzzled my nose against his shirt. TAKE OUT THE DAMN TRASH!! !